In developed nations like the U.S., there has been a shift in the statistics of young population who opted for farming. The population of farmers were left to a negligible number. Thus, with the introduction of robots into the agricultural sector, it has been easier to yield more crops with less time and more effort. The need for using less chemicals and fertilizers for optimization of jobs like pick-and-place, weeding and spraying has increased the demand for agricultural robots in the market. Apart from that, workforce decline in case of potentially dangerous farm jobs especially weeding of lettuce, has replaced human labor and propelled the market for agriculture robots in the years to come. There is an accelerated pressure for automation for routine farm tasking in order to make them more productive. This may also curtail investment in order to buy machines that are expensive, thus acting as an important factor to drive the market for agriculture robots. Robots are available for various kinds of productivity work like that of cow-milking, strawberry picking, grapevine pruning along with other specialized tasks. However, the high cost of installing agriculture robots may act as a hindrance in the growth of the agriculture robot market. Adding to that, these robots also need high maintenance and this also comes with a price. Since these robots are integrated with advanced sensor technology, like high definition cameras, and obstacle sensors, it also amplifies the cost of the machines, thus obstructing the overall growth of the market. The global agriculture robots market is anticipated to expand at a CAGR of 24.1% within the forecast period of 2016 to 2024. Previously, the market was valued at US$1.01 bn at the end of 2016, in terms of revenue. By the end of the forecast period, the valuation is anticipated to be a worth of US$5.7 bn in terms of the overall revenue share of the market. The global agriculture robots market is segmented on the basis of type, where the key classifications are spraying robots, automated robots, milking robots, drones or unmanned aerial vehicles and driverless tractors. On the basis of application, the global agriculture tractor market is classified into agricultural inventory management, weather tracking and forecasting, pruning management robots, spraying robots, irrigation management robots, dairy farm management robots, field mapping robots, harvesting management robots and soil management robots. The global agricultural robots market is studied on the basis of key geographies Europe, North America, Middle East and Africa, Asia Pacific and Latin America. The region contributing the largest revenue share in the market is North America, owing to the high presence of vendors for agriculture robots. Due to the presence of higher farming land, Asia Pacific, is anticipated to grow at a rapid speed. The government in developing nations of China, Japan and India are also focusing on adopting various strategies in order to increase agricultural production so that they can feed their increasing population. Some of the key players in the global agriculture robots market are Clearpath Robotics, Naio Technologies, PrecisionHawk, Inc., Harvest Automation, Inc., and SenseFly SA. Agriculture robots perform different operational tasks such as capturing images, seeding, spraying water, harvesting, and milking among others. The growing need for food and scarcity of agriculture labor is boosting the growth of agriculture robots market. The global market for agriculture robots is majorly driven by increase in precision agriculture and increase in need for real time data which helps in decision making. Moreover, the global market of agriculture robots is experiencing a growth due to increased corporate farming and increase in demand for food production. 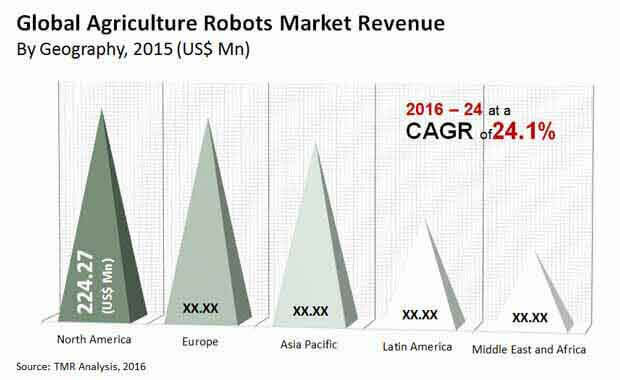 The above mentioned trends are propelling the market of agriculture robots globally at a significant pace. Ongoing research and developments undertaken by different companies across the globe are expected to boost the market of agriculture robots during the forecast period. The growing market in the emerging regions such as Asia-Pacific and Latin America are anticipated to grow the market of agriculture robots in these regions. Propelled by rapidly increasing demand for food, the manufacturers are adopting new robust technologies to modernize the existing robots. In addition, robots also help in spraying the right amount of chemicals, fertilizers and pesticides without human involvement, which is generating interest among the farmers or growers round the globe. However, due to high cost of the machineries, the market of agriculture robots is experiencing a limitation in the market growth. Another factor hindering the growth of the market is the limited functionality of the agriculture robots. The effects of these limiting factors are expected to reduce over the forecast period from 2016 to 2024. In the report, the market of agriculture robots is segmented on basis of type, application and geography. The report also consists of market drivers, market restraints and future opportunities. It highlights the present market trends and provides forecast from 2016 to 2024, additionally it provides the market size of 2015. As per the present scenario for agriculture robots market and the future trends highlighted in this report, it is expected that the market will have substantial growth over the forecast period from 2016 to 2024. Geographically, the market of agriculture robots has been segmented into North America, Europe, Asia-Pacific, Middle East and Africa and Latin America. North America has the largest market share in 2015 followed by Europe and Asia-Pacific. Asia-Pacific is estimated to be the fasted growing region globally with the highest CAGR. This is due to huge sums are being invested in the field of agriculture machineries. Based on by type segmentation, the market is bifurcated into UAV, driverless tractors, milking robots, automated harvesting machines and others. In terms of revenue UAV is estimated to be the fastest growing sub segment from 2016 to 2024. The UAVs are comparatively less expensive than the driverless tractors and due to increase in demand of precision agriculture the UAV sub segment is growing at a faster rate than the other sub segments. The driverless tractors held the largest market share in 2015 and is estimated to experience a downfall in market share till 2024. The application segmentation is categorized into field farming, dairy management, indoor farming, horticulture and others. The demand for fruit production is increasing at higher pace and due to this the horticulture sub segment is anticipated to be the fastest growing among other application segments. The field farming contributed the largest share of the total revenue in 2015. The report provides global market size and forecast from 2016 to 2024 for each segment along with market size of 2015. This report also includes company profiles of major as well as emerging players in the field of agriculture robots market that incorporates different strategies adopted by the companies to expand their distribution channel or developing their own machineries with more enhanced technologies. Most of the companies are undergoing research and developments which is anticipated to fuel the market of agriculture robots over the forecast period from 2016 to 2024. The major players in the market are AGCO Corporation, Harvest Automation, Inc., BouMatic Robotics BV, AgEagle Aerial Systems, Inc., Vision Robotics Corporation, Naio Technology, PrecisionHawk, Inc., SenseFly SA, Agribotix LLC, and Blue River Technology, Inc.